Have a bowl of tea! 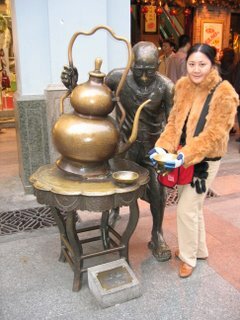 In city of Harbin China, it's common to see such big giant tea pot at restaurants. Tea served in this region of the country is different from the south. Usually a lower but not lowest (dim sum) grade of ooglong combined with dried goji berries, a couple slices of ginseng and a cube of rock sugar served in gaiwan. 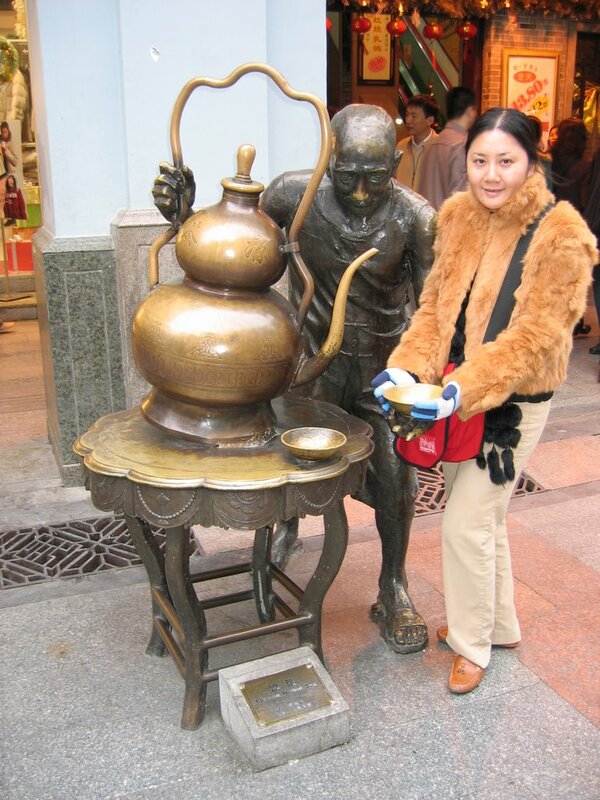 As you are seated by a hostess, a specialist carrying a giant tea kettle on his shoulder about the size of the bottom globe of the kettle in picture comes around pours HOT water into the gaiwan from a distance, about 2 feet away. Every time, the water lands precisely in the gaiwan with a little splash. The water shoots out like a fountain stream. Imagine catching a bowl of tea from the Bellagio water fountain. I am sure we will not have the luxury to have tea served in this manner in the US. The business will not be able to sustain for long due to law suits after law suits. HA!